October 17, 2017, Taipei, Taiwan – HWBOT, an organization regulating international Overclocking competitions and rankings, today officially announces the Taipei II leg of the HWBOT World Tour 2017. Hosted on the doorsteps of the famous Taipei Electronics Market, HWBOT plus partners Intel, Seasonic, G.SKILL, CoolPC and Coolaler will give local PC enthusiasts a taste of Ambient and Extreme competitive overclocking. Local technology enthusiasts are invited to enjoy free Overclocking Workshops just outside the Syntrend Creative Park. Located next to the famous Taipei Guanghua Computer Market, visitors who sign up for a workshop session will be treated to expert tuition from local Overclocking master Coolaler. After learning the basics of overclocking, it’s time to get hands on and start making some benchmark scores of your own. Submit your highest score to the OC-ESPORTS platform and you could be invited to compete in a live 1v1 final contest with some great hardware prizes for winner. OC Workshops will be conducted in Chinese throughout the day on October 21st and 22nd and will be conducted by Coolaler, one of Taiwan’s most seasoned and respected overclockers. The OCWC Taipei II Qualifier contest will hosted outside the Syntrend Creative Park in downtown Taipei city. Attending overclockers will compete using a similar contest format to those used in previous OCWC 2017 contests. A Qualification Phase on Day 1 will see all competing overclockers compete across three benchmarks within a limited 3 hour time frame. The highest four scorers will be invited back to compete in 1v1 Semi-Final and Final matches on Day 2. The Overclockers Gathering is a place for overclockers to meet and enjoy overclocking together in a relaxed environment with unlimited access to LN2. The event is a BYOC (Bring Your Own Computer) event. To take part you need to purchase an LN2 ticket (see below). The LN2 ticket also includes a chance to participate in the Overclocking World Championship Taipei II 2017 Qualifier (see above). To compete in the OCWC Taipei II 2017 Qualifier contest you must first purchase an LN2 Ticket. LN2 Tickets include a chance to compete in the OCWC Taipei II Qualifier contest, a seat at the Overclockers Gathering and access to unlimited LN2. As with many of the world’s most exciting overclocking events, Intel are making a massive contribution. 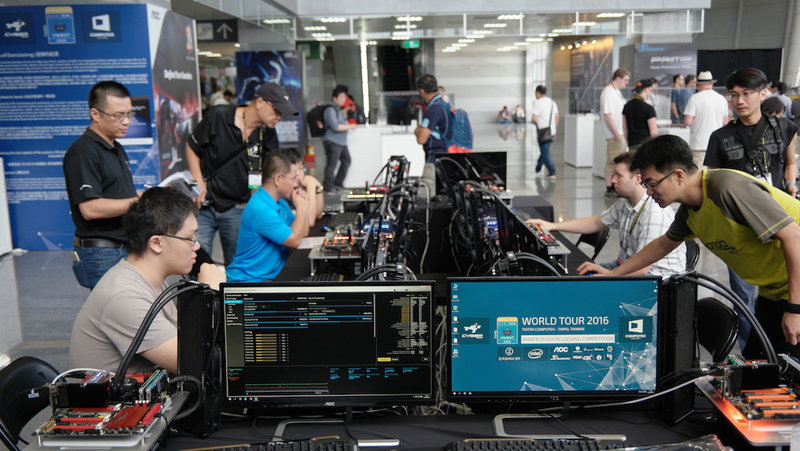 All Taipei 2017 overclocking workshops and contests will use Intel® Core™processors. As official Power Supply partner of the HWBOT World Tour 2017, the latest Seasonic Snow Silent 750W PSUs will be used to power all Overclocking Workshop systems at Syntrend Creative Center. All memory and SSDs used in the Taipei II 2017 event will be provided by partners G.SKILL. Specializing in high performance memory, SSD products and gaming peripherals, G.SKILL combining technical innovation and rock solid quality to establish themselves as the No.1 choice for overclockers. Established in 1995, CoolPC is an award-winning PC hardware retailer, located in 8 major cities across Taiwan. With more than 20 years dedicated to providing an excellent PC building experience and customer satisfaction, we provide a complete range of convenient services from online ordering to direct delivery of your PC, as well as a full after-sales technical service & repair support team. CoolPC also carries a wide selection of laptops, computer peripherals, and PC gaming products! The Taipei II 2017 event is organized in conjunction with Coolaler, a well known and respected overclocker from Taiwan. Coolaler will host all overclocking workshops which will be conducted in Chinese.